Last weekend, we had exactly 20 hours in Delhi between arriving from Dharamsala and departing for Leh. In that time, we had only a sliver of hope that we might get our digital camera fixed. We had assumed that the only realistic option would be to ship it off to a Panasonic service centre for a couple of weeks, which would do us no good as we had a flight to catch at 5am the next morning. But, as we were headed to one of the most photogenic places in the world, we figured it was worth a shot. 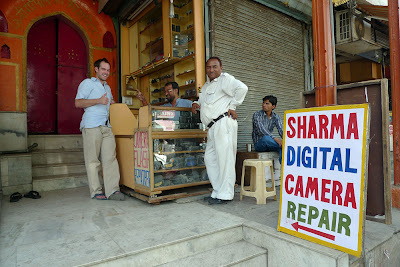 We started our day by checking out a camera shop in Connaught Place, an upscale shopping district in New Delhi. They took one look at our camera and insisted that one day was not enough time for the necessary repairs. We begged for any advice they may have and they half-heartedly suggested we check out Chandhi Chowk market in Old Delhi. Old Delhi is filled with markets that offer specific goods and services. For example, on the way to Chandhi Chowk we drove through a market comprised of only wedding invitation shops. Next to that was a market of over two dozen stores all selling various forms of chains - new ones, old ones, dirty ones, etc. 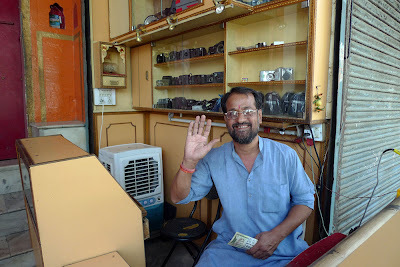 In Chandhi Chowk, our autorickshaw driver pulled up to one of the many camera repair stands and suggested we give them a try. The guy behind the counter turned our camera on and off a couple of times with his ear pressed against it. After a couple of seconds of consideration he said he could have it fixed in two hours for 2500 Rupees (about $60). We must have looked a little skeptical, because he brought out a box from under the counter and proclaimed: "Look, this man send me his camera all the way from the Netherlands. He knows I am the best repairman." Nothing in India is too broken to be fixed. Around every corner you can find someone to glue your flip flops back together, or rewire your alarm clock. In Canada, when I have tried to have various items repaired - shoes, cell phones, ipods, printers, even a paper shredder - I have been given the same response every time: "Even if we can fix it, it will cost you more than just buying a new one." So the old one gets thrown out and sent to some wasteland, most likely in India or China. We headed back to Chandhi Chowk after a couple hours of sight-seeing and, true to his word, the camera was running perfectly. When we asked for a detailed receipt so that we might claim the repairs on our insurance the guy just laughed. After we insisted, he took out one of his business cards and wrote "Panasonic, 2500 Rupees" on the back. He passed it to me and muttered, "Insurance... must be nice." This dude is a whiz!